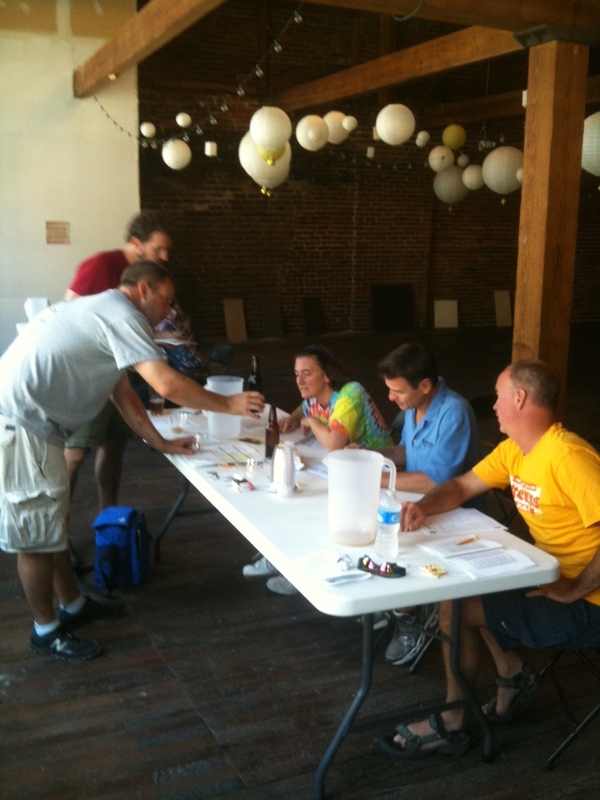 The Tennessee Valley Fair and the local homebrew club I’m a member of, The Tennessee Valley Homebrewers, teamed up for the fair’s first ever homebrew competition. Homebrew competitions have been a big part of other state’s & region’s fairs for years (most famously the Indiana State Fair’s Brewers’ Cup.) It’s about time something like this took place locally. The judging for the competition, the 2011 TVH Homebruin Cup , took place Saturday August 27th on the 5th floor of the Woodruff Building on Gay street. The Woodruff building is home to Downtown Grill & Brewery and Woodruff Brewing Company. This was a BJCP sanctioned event. I am not a BJCP judge, although I’d like to be. I have committed to once a month study classes to prepare for taking the exam in July of 2012. For this competition I volunteered to be a steward . My duties were to help organize entries in the cooler and to help the judges. I gave them bottles, told them what the entry number and what style of beer each one was. I also checked the judge sheets and filled out the cover sheets for each entry before handing it in. I learned a lot by watching & listening to the judges and judging process. Judging took place in 2 shifts. The morning shift started at approximately 10 am and went until 12:30. 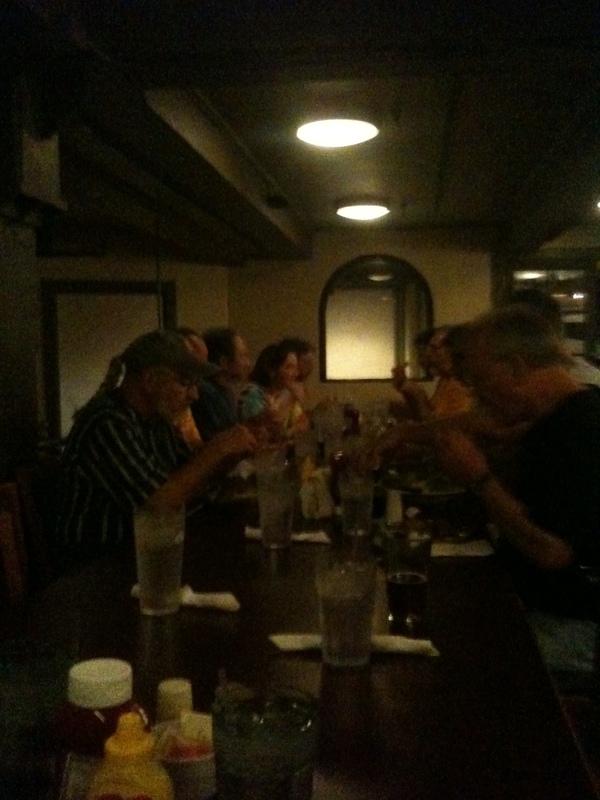 After the first shift everyone went downstairs to the restaurant to a big meal generously provided by the brewery. Ok, let’s me go off on a tangent right now. Anyone who reads my blog knows how much I love Woodruff’s and the Downtown Brewery. It is my home, my go to place, my version of Cheers, where everyone knows my name. Let me tell you, the hospitality that they’ve shown the homebrew club over the years and for the judging in particular was incredible. Maybe that isn’t a strong enough word. They really went out of their way to help us. Just the fact that they let us use their 5th floor for the event was incredibly generous of them. They also let us use their basement and walk in cooler as a staging area for the beer. The brewer, Al, brought us glasses and several growlers full of beer for everyone to drink on. They made a point to check in with us several times to make sure we had everything we needed. The amount of food provided to us at lunch was enough for everyone to gorge themselves. They are a class act through and through. Thank you so much guys! Alright, so after lunch it was on to the afternoon shift. Several of the judges and stewards from the morning shift couldn’t stick around for the afternoon. I ended up stewarding a table by myself. It is an interesting experience to sit there and listen to the judges critique your beer while making sure to keep a poker face. I had entered 5 beers in the competition. To be honest, I knew up front that at least 2 of them were awful when I entered them. I was hoping the feedback provided would help point out to me where I went wrong. I honestly did not expect to win any medals. I took into consideration when I entered them the fact that I would be up against brewers who have been doing this for 2o plus years, and that our club has many award winning brewers that make beer, in my opinion, that is far superior to mine. The reason I entered the competition was not because I thought I might win, but for the detailed feedback that is provided by the judging process. I knew I could use this feedback to point out where I could make improvements in my brewing processes. I basically entered so I could learn things that would help me become a better brewer. I got exactly what I expected. I didn’t win, although my pale ale was 1 point away from 3rd place. I did get the great feedback that I expected. Some of the things pointed out to me have already changed the way I brew. Overall it was a great learning experience. The last round of the day was for fruit beer and BJCP style catagory 23 “specialty beer” or as the judges called it “weird beer”. It’s for beer that doesn’t fit in any of the other catagories. I stewarded this round as well. We did fruit based beer first. Then I got to play a joke on the judges. When we pull the next entry out of the cooler, we tell them what the entry number is and what kind of beer it is as well. I pulled out a beer, gave them an entry number and told them it was a cucumber, mustard seed, coconut beer based on a light American Lager. They all moaned and the look on their faces was priceless. I still laugh when I think about it. I told them I was just kidding and told them the real type of beer. They all had a sigh of relief. One of the judges told me that he was going to quit when I announced that one. So, fellow homebrewers please, we all can appreciate a well done “weird beer”, but don’t go making a cucumber, mustard seed, coconut beer based on a light American Lager. It’s not something that will win you any friends. Well if you are interested to see who won the competition, you can click this link. Congratulations to all the winners and a big thanks to everyone who participated. I plan on being back next year. Who knows, I might even place if I can step up my game between now and then. This entry was posted on Tuesday, August 30th, 2011 at 15:56 and is filed under Beer, home brewing. You can follow any responses to this entry through the RSS 2.0 feed. You can leave a response, or trackback from your own site.